There are few hype men as effective as a college football team's mascot, who can rile up a crowd even when the score is lopsided. 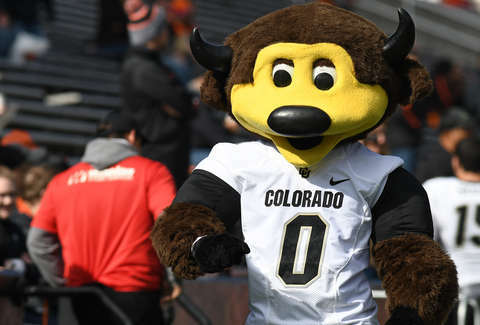 However, it was the crowd itself that had to help cheer on the University of Colorado's Chip the Buffalo over the weekend, after he accidentally fired a powerful t-shirt cannon into his crotch, fell to his knees, and was carted off the field to seek medical attention. The unfortunate incident went down during last Saturday's matchup between the University of Colorado and the University of New Hampshire in Boulder. Chip, the besuited anthropomorphic Buffalo, was prepping to shoot a t-shirt into the crowd from the sideline when the device malfunctioned at just the wrong time, and he took the brunt force of the cannon's power straight to the groin. And if you've ever wondered just how much power a t-shirt cannon wields, you need only watch how quickly Chip fell to the ground, doubled over, and writhed in pain. Plenty of onlookers had their cameras out to capture the moment. The moment should send a shockwave down the spine of any man who's taken even the slightest of shots to the nuts. It's tough to even imagine how painful it must have been. However, a pro under even the worst of circumstances, Chip didn't even take his head off in the chaotic aftermath as medics rushed to his aid and plopped him into a cart to take him off the field. In fact, he managed to keep waving to fans even as he rode away, reveling in the supportive roar from the crowd. Thankfully, Chip's injury wasn't a career-ender, and he made it back out shortly after tending to his tender nethers, even snapping a pic to prove he's doing just fine thanks. Makes you wonder if he'll be walking out on the field wearing a cup from now on, though.